A system of regions towards the back and middle of your brain help you interpret the text. 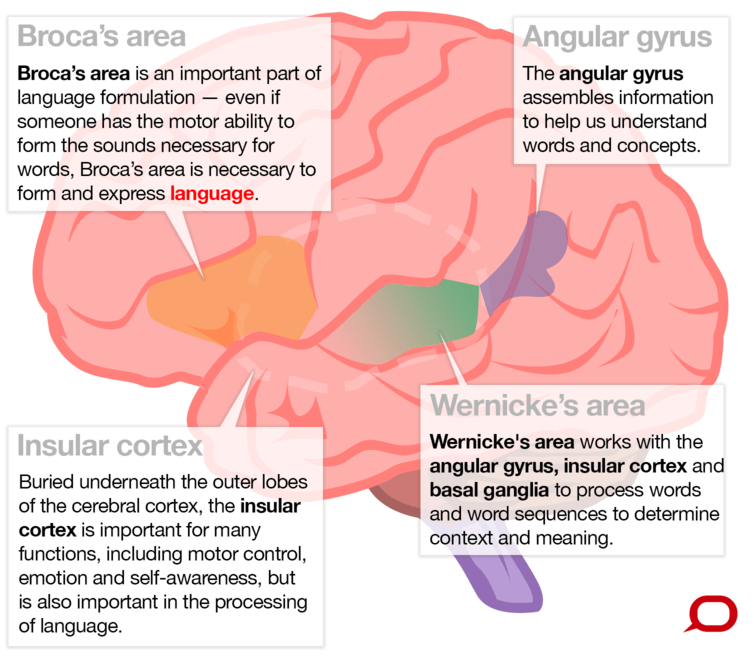 These include the angular gyrus in the parietal lobe, Wernicke’s area (comprising mainly the top rear portion of the temporal lobe), insular cortex , basal ganglia and cerebellum . To speak sensibly, you must think of words to convey an idea or message, formulate them into a sentence according to grammatical rules and then use your lungs, vocal cords and mouth to create sounds. Regions in your frontal, temporal and parietal lobes formulate what you want to say and the motor cortex , in your frontal lobe, enables you to speak the words. In 1861, French neurologist Pierre Paul Broca described a patient unable to speak who had no motor impairments to account for the inability. A postmortem examination showed a lesion in a large area towards the lower middle of his left frontal lobe particularly important in language formulation. This is now known as Broca’s area . Scientists have also observed injured patients with other selective problems , such as an inability to understand most words except nouns; or words with unusual spelling, such as those with silent consonants, like reign. We also know the brain’s language regions work together as a co-ordinated network , with some parts involved in multiple functions and a level of redundancy in some processing pathways. So it’s not simply a matter of one brain region doing one thing in isolation. In the mid-20th century, this helped neurosurgeons discover more about the localisation of language function in the brain . It was clearly demonstrated that while most people have language originating on the left side of their brain, some could have language originating on the right. Towards the later part of the 20th century, if a surgeon needed to find out which side of your brain was responsible for language – so he didn’t do any damage – he would put to sleep one side of your brain with an anaesthetic. The doctor would then ask you a series of questions, determining your language side from your ability or inability to answer them. This invasive test (which is less often used today due to the availability of functional brain imaging) is known as the Wada test , named after Juhn Wada, who first described it just after the second world war. Using MRI to measure brain function is called functional MRI (fMRI), which detects signals from magnetic properties of blood in vessels supplying oxygen to brain cells. The fMRI signal changes depending on whether the blood is carrying oxygen , which means it slightly reduces the magnetic field, or has delivered up its oxygen, which slightly increases the magnetic field. Functional MRI is also becoming a useful clinical tool. In some centres it has replaced the Wada test to determine where language is in the brain .